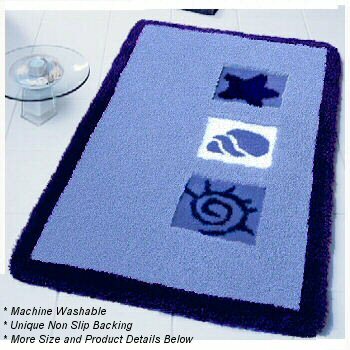 Beach themed bath rugs great for childrens bathrooms or to bring the sandy beach into your home. The design includes seashells and starfish. Azure Blue: Azure blue background with inset squares seashells and starfish with a dark royal blue border. The squares with the sea creatures are a medium tone blue with dark royal blue accents. Rust: Rusty orange background with inset squares of seashells and starfish with a dark rust border. The squares with the sea creatures are a peach orange tone with dark rust accents. Maize Yellow: Soft bright yellow background with inset squares of seashells and starfish with a dark golden yellow border. The squares with the sea creatures are a rusty brown tone with dark golden yellow accents. Oyster Grey: Very light soft flannel grey background with inset squares of seashells and starfish with a dark blue grey border. The squares with the sea creatures are a blue grey with medium tone grey accents. Sand Beige: Sand beige background with inset squares of seashells and starfish with a medium tone caramel brown border. The squares with the sea creatures are a medium tone caramel brown with yellow brown accents. Beach elongated lid covers are a solid color and coordinate with base background color of each rug swatch.